Note: This article is a continuation of the StanGrad series, highlighting CSU Stanislaus students who graduated at commencement ceremonies May 30 and 31. Click here  for more. Angelica Martinez stepped in front of the audience at the CSU Stanislaus Master of Social Work hooding ceremony last month and began her remarks using sign language. When she was 2 years old, she signed, a doctor told her parents she was profoundly deaf and that they should temper their expectations for her future success. When Martinez got to the part in her story about visiting the same doctor at the age of 10, she eschewed sign language and said aloud — as she had to the unsuspecting doctor that day — "Hello, my name is Angelica Martinez, and I have an appointment with you." Martinez vocalized the remainder of her remarks, capping her academic journey with a public moment that left her fellow graduates and others in attendance cheering. Her doctor's doubt was one example of the limitations and restrictions Martinez has encountered, but her parents taught her to turn them all into motivation. "It wasn’t long before I realized that knowledge carried the key to help me get through many barriers," Martinez said. "(I learned) to not be afraid to ask 'Why?' and 'Why not?' I would keep asking and asking until I found myself on the other side of barrier." An Oakland native who earned her bachelor's degree in sociology with a human services concentration at CSU Stanislaus, Martinez has made it her mission in life to advocate for and assist the deaf and hard of hearing. She's worked with both the city of Merced and its Mercy Medical Center in recent years to implement videophone technology to improve communication with deaf people and patients. In April, she gave workshops on relating to the deaf population to 80 social workers in Merced County. 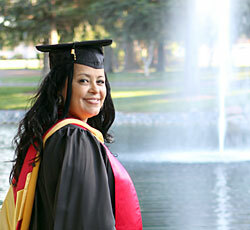 She also received an award for her work with the Merced County Community Action Agency, interned with the county's Department of Mental Health, and worked with Deaf and Hard of Hearing Service Center, Inc.
Martinez has also excelled academically, maintaining a grade-point average of 3.8 while raising six children with her husband. With her master's now complete, Martinez hopes to become a Licensed Clinical Social Worker and eventually earn a doctoral degree, with the overarching goal of improving deaf cultural competency among social workers in mental health settings. And she'll continue to be motivated by those who have doubted her. "There are many memories that stand out, but I'll never forget the beautiful scenery. The yellow leaves on the ginger trees and the tranquility of the fountains and lakes around campus never failed to give me some sense of peace, especially when I was under a lot of stress or needed to think." "I have the greatest respect for Professor John Garcia, chair of my thesis committee. Regardless of my deafness, he accepted me as a student and saw no limitations in me. He always pushed for me to work harder that I thought I could, mainly because he had a lot of faith that I would succeed even when I was in doubt." "If you set your mind to achieving your goal, you will succeed. If you have passion in what you're learning, your goal will be easier to reach. There's no such thing as disability — it's just another obstacle you have to find your way around, and with passion, dedication and motivation, you will go further than you ever imagined."